Electronics is a key technology for medicine—from diagnosis to treatment. Increasing digitalization of all aspects of life and the patients' wish for more autonomy are driving this development forward more quickly. At electronica, which takes place at the Messe München trade-fair center from November 8 to 11, several exhibitors will present the latest technologies and products for medical electronics. The World's Leading Trade Fair for Electronic Components, Systems and Automation will focus on increased networking of components as well as greater precision and automation. Medical technology is one of the most innovative industries in the world. According to the industry association MedTech Europe, more than 11,000 patents from the medical technology sector were submitted to the European Patent Office in 2014—more than all other branches of industry together. 41 percent of those innovations were submitted by European companies. The market is characterized by rapid progress, even in Germany. The German Medical Technology Association (BVMed) reports that approximately one-third of German manufacturers' sales are generated by products that are no more than three years old. According to BVMed, global sales across all sectors increased by 6.8 percent in 2015. That figure was 4.6 percent in 2014. And electronic components are one of the most important drivers of innovation. They are wrapped around the wrist and placed in our ear or our running shoes: Wearable healthcare devices are expected to revolutionize medical care in the next few years. Physicians can monitor their patients' vital statistics or even diagnose illnesses from afar. Technology also has a great deal of potential when it comes to prevention because illnesses can be recognized earlier and with greater accuracy. Electronic components—from sensors and elements in the signal chain, i.e. power management, controllers and wireless units—constitute the heart of wearables, which collect and analyze data. A panel discussion titled “Wearables for Healthcare—Components for Digital Medicine” at 14:00 on November 8 (Hall A3, Stand 242) is dedicated specifically to components of this type. Industry representatives will explain what capabilities wearables must have to meet the healthcare sector's future requirements. The plenary session's participants include Jeanne Forget-Funk, VP Marketing, Bosch Sensortec, Markus Vogt, Director Segment Healthcare, EBV Elektronik, and Ruben De Francisco Martin, Program Manager Wearable Healthcare, IMEC. Presentations titled “Printed Electronics: Key Enabling Technology for Healthcare and Wearables” and “Wearables for Health—Components for Digital Medicine” are also on the agenda. In addition, the session titled “Mechatronic Solutions for People with Disabilities and the Cybathlon” that ETH Zurich is holding at the electronica Forum will examine the various ways that robots can help people with paralysis of the extremities (November 8 starting at 15:30; Hall A3, Stand 242). AMSYS is presenting a series of digital low-pressure sensors at electronica 2016 that are designed especially for the future. A digital pressure signal is available as an output signal that is proportional to differential pressure changes. The sensor meets high medical requirements with regard to resolution and precision. The thing that makes the sensors special: Their miniaturized design, the improved zero position in the bidirectional differential version of the SM9541, and the fact that the bidirectional version can measure ultra-low and overpressure. As a result, it can be integrated into small and complex medical devices. The long-term stability of the sensors is listed as 0.2 percent per year. The miniature sensors are used to monitor breathing, in incubators, apnea devices and to monitor gasses (flow meters) and filters. SIIX-AGT MEDTECH has developed a robot for use in the medical sector. The “Merlin” logistics robot is self-propelled and equipped with the Intuitive Power Drive System, a control platform for robots. The special thing about Merlin: it is GPS controlled and can find its way around the hospital on its own. Equipped with artificial intelligence, it optimizes its own route every time it takes it. Thanks to its sensors, it detects and goes around obstacles. Merlin's other special feature: It is equipped with a cooling unit, so it can also be used to transport laboratory samples or vaccines in hospitals. Caption: Electronics is a key technology for medicine—from diagnosis to treatment. At electronica, which takes place at the Messe München trade-fair center from November 8–11, several exhibitors will present the latest technologies and products for medical electronics. Electronics is a key technology for medicine—from diagnosis to treatment. 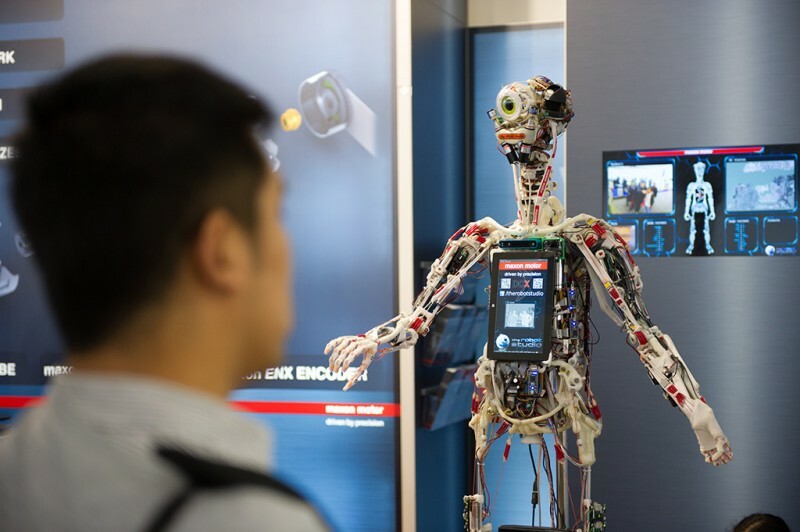 At electronica, which takes place at the Messe München trade-fair center from November 8–11, several exhibitors will present the latest technologies and products for medical electronics.